CAIRO, Egypt (CNN) -- An Egyptian business tycoon and a former police officer have been found guilty in last July's slaying of a rising Lebanese pop singer. Hisham Talaat Moustafa, a real estate mogul, has been found guilty of Suzanne Tamim's murder. 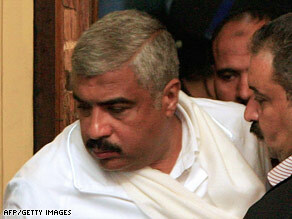 The case, with its high-profile victim and defendant, has captivated Egypt and the region. A judge convicted and sentenced to death real estate mogul Hisham Talaat Moustafa and the former officer Muhsen el Sukkari on Thursday. Egypt's Grand Mufti -- the country's highest religious official -- will review the sentence and rule on June 25 if the men will be executed, the judge said. Because the two men were sentenced under Islamic law, it is widely expected that they would be hanged. Mustafa's lawyer told reporters outside the courtroom that he will appeal the conviction, saying there was "a one million percent guarantee" the sentence would be overturned. The singer, Suzanne Tamim, was found slain in her apartment in the United Arab Emirates. She had been stabbed and her throat slit. Prosecutors alleged that Moustafa, a parliament member for the ruling National Democratic Party, paid el Sukkari $2 million to kill Tamim. During the trial, Moustafa's lawyer told CNN his client loved the singer, but could not take Tamim as a second wife because his family objected. Polygamy is legal in Egypt, and it's not unusual for men -- such as Moustafa, a married father of three -- to take on additional wives. Prosecutors have said Tamim's death was a "means of taking revenge," but have not elaborated. Moustafa and el Sukkari claim the prosecution's evidence could have been fabricated or tampered with by UAE authorities and should not be used against them. Although Tamim was killed in the United Arab Emirates, the Egyptian judiciary tried the case in Cairo because the accused were arrested in Egypt. After his arrest in September, Egyptian authorities indicted Moustafa, stripped him of his parliamentary immunity and jailed him pending trial. He also resigned as chairman of Talaat Moustafa Group -- a conglomerate with construction and real estate arms that was founded by his father, Talaat Moustafa. Moustafa's brother, Tarek Talaat Moustafa, now chairs the company. CNN's Raja Razek and Housam Ahmed contributed to this story.